Gumbo: A soup or stew associated with lower Louisiana, evolved from cuisines of the French, Spanish, Indians and African cultures that populated the region. Also refers to many components blending together to create a new form that’s better than the individual parts. Think jazz music or the Ole Miss student population. Get out your stockpots and rice cookers because it’s gumbo time in the South. Of course, a good gumbo is appealing any time of year, but it’s especially significant during Mardi Gras, that carnival of excess preceding the Christian Lenten season. 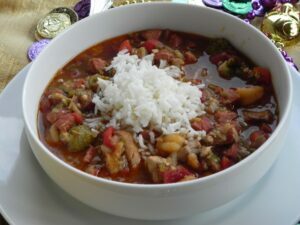 As discussed last week, the word gumbo came to the English language in Louisiana from several African dialects (“gombo” or “ngombo” or “ki ngombo” and other variants meaning okra), and from the Choctaw Indian word “kombo” (meaning sassafras). After the French, Spanish, African and Choctaw peoples comingled their cultures and food ways in the region, the word evolved to represent a dish that is a cross between a soup and a stew served with rice. The word has transformed in the English language to reference a spicy blend of multiple components, whether people or food. The true origins of gumbo and its ingredients are murky, although classic seafood gumbo closely resembles a French bouillabaisse but containing Louisiana-style additives. The dish of gumbo has been referenced in print since 1803, when a record was made of a gumbo that was served at a gubernatorial reception in New Orleans. Also in 1803, a Frenchman, Louis Narcisse Baudry de Lozière, wrote a travelogue titled Second Voyage a la Louisiane. In it he praised the medicinal and gustatory properties of the gombeau plant (okra) used widely by the region’s Creoles, Europeans, and natives in their stews. The plant had been flourishing in the New World already for decades (okra had made its way as far north as Philadelphia by 1740). Anyone acquainted with the folks in our neighboring state and our own region know that there are about as many types of gumbo as there are people making it. The stew evolved from a seafood dish to include any type of meat available, combined with a range of greens and herbs. The two constants in most any gumbo are the Louisiana Trinity of onion, celery and bell pepper, and a homemade stock made from the ingredients. Gumbos have a consistency thicker than that of soup. The thickness is achieved through addition of roux with okra or file powder. Can a gumbo be a true gumbo without one or more of these ingredients? Perhaps, but I wouldn’t eat it. Traditionally, one would add either okra to the stock or filé powder to the finished gumbo for additional thickening and flavoring. Before refrigeration, filé was used during the winter when okra was out of season. Only in recent times have gumbo cooks realized that a sprinkle of file powder — added to individual servings like hot sauce — enhances the subtle flavors of the dish. Okra was introduced to the region’s upper-class Creole residents by their African slaves. Okra pods have a mysterious ability to dissolve during cooking, absorbing the flavors of the other ingredients and releasing a mucilaginous liquid that thickens the gumbo. Use of tomatoes in okra gumbo is hotly debated, and somewhat related to location. But no one can disagree that the acid from tomatoes reduces the sliminess of cooked okra. Choctaw tribesmen introduced file, made from dried and ground sassafras leaves, to their neighboring Acadian (Cajun) transplants. Although use of filé has fallen somewhat out of fashion in recent years, it adds a lovely depth of flavor to a gumbo. But the piquant powder should be added to individual servings, or stirred into the pot just after removal from the heat. If added during cooking, filé will become stringy. Roux first came to the region’s cooking pot with French settlers. Roux is flour-based gravy thickener. Properly cooked roux can range in color from light to dark. The darker the roux, the stronger the flavor, but the lightest roux has the strongest thickening power. One tends to find stronger emphasis on dark roux and filé in Cajun-style gumbos, and more usage of okra in Creole versions. But the two preferences commingled in the same pot so long ago that it is up to the cook to decide what works better. Each season seems to feature a different type of gumbo due to the agricultural bounty available. There’s Green Gumbo for Mardi Gras. Seafood Gumbo for Lent. Turkey Bone Gumbo after Thanksgiving. Duck Gumbo in the fall and winter. Chicken and sausage gumbo year round… and whatever else a hunter or cook can gather to throw in the gumbo pot. This week we are featuring the two gumbos that are classics for Mardi Gras: Green Gumbo known as Gumbo des Herbes (Gumbo Z’herbes, pronounced zerv or zeb), and Seafood Gumbo. Creoles in the New Orleans area of Lower Louisiana make up Gumbo Z’herbes for Lundy Gras (the last Monday before Ash Wednesday) and Fat Tuesday (also known as Mardi Gras Day, the final day of carnival before Lent begins on Ash Wednesday). Although eaten year round, Seafood Gumbo without meat is consumed during Lent. Most seafood gumbos are forgiving — tasting good with whatever watery critters the cook throws into the pot. And a seafood gumbo can be stretched for several days: The Old Bride has been known to recycle leftover gumbo by adding more stock and new (often different) seafood to the leftovers. Gumbo Z’herbes is much more mysterious for those of us who live north of the I-10 (Interstate Highway 10). This dish is no simple pot of greens. According to Creole tradition, Gumbo Z’herbes should nourish a person’s body enough to sustain the soul through the 40 days of Lenten sacrifice (doing without meat). A classic Green Gumbo should contain an odd number of greens and meats. One resource consulted by The Old Bride suggested that the odd numbers should combine to make up 14, perhaps to represent the 14 stations of the Cross. The Old Bride called New Orleans foodie Sara Roahen for advice on making a genuine Creole Green Gumbo, and for Roahen’s opinion on what makes Green Gumbo different from a good ol’mess of greens. Is it the addition of roux and Creole spices? Is it the rice? Is it the odd number of greens? She said it’s all of those factors. Roahen apprenticed on this particular gumbo under Leah Chase, chef and author of The Dooky Chase Cookbook. When contacted, Roahen happened to be up to her elbows finishing her own annual mega-pot of Gumbo Z’herbes. She lives on a major Mardi Gras parade route, and makes the gumbo as part of her Mardi Gras preparations for drop-in parade guests on Sunday and on Lundy Gras. “This definitely is more than a pot of greens, although I love that, too,” Roahen added. “According to Ms. Chase’s instructions, the greens in this gumbo must be pureed before combining them with the assorted meats and roux. Pureeing the greens changes the gumbo, adding a complexity of flavor that is indescribable. Roahen said she has studied numerous recipes for Gumbo Z’herbes, including meatless versions, which create their own delicious stock (what The Old Bride would consider a pot likker). But Roahen relies on the genuine Creole version she learned under Chase. This is my interpretation of the Dooky Chase version. I have found that this has more of a soup consistency unless adding lots of meat and the filé! Leah Chase recommends cooking the raw onions and garlic with the greens for 30 minutes rather than sautéing them separately, so that all greens can be strained from the pot likker and pureed (including the onions). She also steams her meats in some of the greens pot likker before combining the ingredients in the stockpot. After thoroughly cleaning all the greens and chopping the greens, cover with water in a large stockpot. Bring to a boil and blanch the greens, then drain to ensure removal of remaining grit. (NOTE: If the greens are really clean, skip this step.) Combine chicken stock/broth with 1 qt water and add the blanched greens. Cook for 30 minutes. Strain the greens, reserving the stock, and puree in a blender or food processor. Return to the stockpot. Add the ham hock and cook until hock begins to fall apart. Remove hock fat. While greens and ham are cooking, sauté the onions and garlic in bacon drippings in a large skillet until transparent. Add the sausage and simmer until the sausage has cooked and juices blended. Pour skillet contents into the stockpot. Stir in additional meats, roux and seasonings, and simmer for about one hour. When ready to serve, remove from heat and stir in filé powder (or sprinkle on individual servings if planning to freeze leftover gumbo). Serve over rice and garnish with green onions. Add hot sauce, salt and pepper to taste. NOTE: I omitted salt in this recipe because of the ham hock, bacon, and Creole seasoning. This gumbo is forgiving – the cook can add whatever seafood is in season or available, although shrimp usually forms the shellfish basis. Scallops are tasty, crab usually is added, and sea fish add flavor as well. What makes this different from a bouillabaisse? It’s all about the roux and the okra and the rice. If the shrimp are fresh and time permits, it is more desirable top create a shrimp stock for the gumbo base. Homemade roux is best, but roux-in-a-jar works fine if time is limited and the cook isn’t competing in a gumbo cook-off like the one held each year in New Iberia, LA. Bring water to boil, and boil all ingredients for about 1-1/2 hrs (liquid will reduce; do not let liquid go below 1 qt). Strain stock, cool; refrigerate until ready to use. Heat oil in large heavy skillet (cast iron works best) until it begins to smoke. Gradually add flour, whisking constantly. Continue cooking and whisking until roux is dark brown. (Remove from heat immediately to prevent overcooking (cast iron continues to heat, so beware). Set aside. OR, if you have time and will be in the kitchen anyway, whisk the oil and flour together in the skillet and place in the oven preheated to 350˚F. Bake for about 2-1/2 hours, stirring about every 30 minutes, until the roux reaches desired coloration (blonde, peanut, paper bag, or chocolate colored). Oven-baked roux takes longer, but is less likely to burn. NOTE: Burnt roux cannot be salvaged. If using jarred roux, stir one cup into 2 to 3 c of boiling chicken stock until blended. Keep warm until ready to use. Sauté shrimp in olive oil, sprinkle with Creole seasoning. Set aside. Sauté onions and celery in bacon drippings until transparent. Add bell pepper, garlic and black pepper. Add sausage and stir. Simmer until sausage is done and veggies are bubbling. Stir in tomatoes, shrimp stock or hot chicken stock, and roux. Bring back to a boil for 10 minutes. Add okra, seasonings and redfish; simmer 20-30 minutes before adding the shrimp. Bring back to a slow boil for about 10 minutes before adding other seafood. Stir to prevent sticking. Simmer on medium-low heat about an hour until thickened. Squeeze in fresh lemon juice and stir to blend. Add additional stock or water if gumbo becomes too thick. Add file if desired. Serve over steamed rice. Garnish with green onions and add hot sauce to taste.